The Use of Multilayer Insulation Blankets on 77K and on 4K Surfaces - Meyer Tool & Mfg. The primary role of a multilayer insulation blanket is to reduce the heat load on a cold surface due to radiation from a surrounding warmer surface. A notable exception is the use of a multilayer insulation blanket to limit the boil-off rate of a cryogenic liquid in the event of a loss of isolation vacuum. 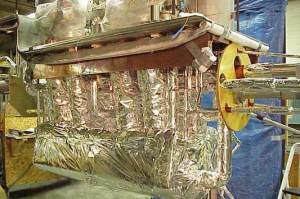 A multilayer insulation blanket will also affect the heat leak due to residual pressure in the dewar vacuum space. It is generally felt that a multilayer insulation blanket will reduce the heat leak due to residual gas in the vacuum space by reducing the mean free path of gas molecules around a cold surface. The multilayer insulation blanket plays a role somewhat similar to that of the cold baffles in a cryopump. In practice, time and pumping speed are available in finite quantities and the presence of a multilayer insulation blanket will generally result in higher pressures in the vacuum space than might otherwise be achieved. The pressure inside a multilayer insulation blanket may be considerably higher than that read on a vacuum gauge located on an external pumping station. Multilayer insulation blankets used on 77K surfaces are typically 20-40 layers in a thickness of about 1". At this point the blanket is limited by conduction through the blanket and adding additional layers will not significantly reduce the heat load on the cold surface. Many different heat shields have been used on 4K surfaces. A single layer of aluminum foil is sometimes used. Single layers of relatively heavy gauge aluminized Mylar may also be found. A single layer of aluminum tape is sometimes used to obtain a low emissivity on the cold surface, but this does not actually constitute a heat shield. Is a multilayer insulation blanket between the 77K and 4K heat surfaces necessary? If so, what would be a reasonable number of layers to use on a 4K surface if the goal is to reduce the radiated heat load to a negligible level? The answer will depend on a number of factors. One is how "light tight" the 77K shield is. In applications where cleanliness requirements prohibit the use of multilayer insulation, extraordinary measures are taken to insure that the 77K (or intermediate temperature) shield is light tight. These measures include the use of continuous seam welds on heat shield joints and elaborately baffled pumping ports. The heat shields in most dewars are generally less elaborate and the likelihood of some thermal radiation leaks may be one factor making a multilayer insulation blanket on the 4K surface desirable. Operating cost may also be a factor. The heat radiated per unit area from a 300K surface to a 77K surface is 230 times larger than that radiated from a 77K surface to a 4K surface. However, with liquid nitrogen costing slightly over $0.30 per liquid liter the cost of removing heat at 77K is only ~$0.0018/KJoule. On the other hand, if liquid helium costs $8/liquid liter the cost of removing heat at 4K is $3/Kjoule. A multilayer insulation blanket on a 4K surface will almost always be cost effective. An ideal heat shield (a stack of perfectly isolated surfaces with equal areas and emissivities) consisting of N layers will reduce the radiated heat between two surfaces by 1/(N+1). A relatively light blanket of 10 layers is sufficient to reduce the radiated heat load to a value well below the heat leak through structures. A multilayer insulation blanket is sometimes used on the surface of a liquid container for the purpose of reducing the heat load on the liquid in the event of a failure of the isolation vacuum. The cryogenic fluids in this case are usually liquid helium or liquid hydrogen. The heat load imposed by condensing air on an uninsulated surface at 4K is approximately 12 kW/m2. If the surface is covered by a 20 layer multilayer insulation blanket that value drops to 0.8 kW/m2. This is thicker than the multilayer insulation blanket that might be used only for deflecting thermal radiation. The multilayer insulation has a significant impact on the boil-off rate of the liquid and the pressure relief requirements of the dewar. When a multilayer insulation blanket is used for this purpose the installation methods may differ from those used on a multilayer insulation blanket which functions only as a heat shield. If a sudden loss of isolation vacuum is possible then the multilayer insulation blanket must remain intact and attached to the cold surface if it is to limit the heat flux to the cold surface after a loss of vacuum incident. A 77K heat shield reduces the radiated heat load from a room temperature surface by a factor of 230; however, the use of a multilayer insulation blanket on the 4K surface to reduce the radiated heat load from the 77K surface is often desirable. The 4K blanket need not be as thick or contain as many layers as the 77K blanket in order to be effective. Allowing an adequate pump down time for the multilayer insulation blankets will improve the performance of both 77K and 4K multilayer insulation blankets. A multilayer insulation blanket may also be used on a cold surface to limit heat transfer to a cryogenic fluid in the event of a loss of isolation vacuum. Care must be exercised in installing or modifying multilayer insulation blankets in these applications.